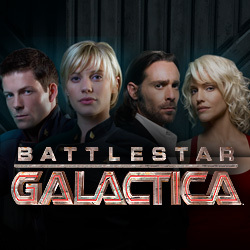 Battlestar Galactica online slots casino game is based on the TV series of the same name. If you’re a fan of the series you’ll love this game. With a militaristic soundtrack and futuristic backdrop the reels transport you to faraway galaxies with the main characters from this iconic TV series. Battlestar Galactica online slots has a 5 reel, 3row, 243payline format. The game also has three different play modes (Normal, Run and Fight) which are randomly triggered and different bonus games apply in the different modes. There arethe usual playing cards at the lower end of the paytable, then moving up through the characters you might be familiar with from the TV series - Tyrol, Ellen, Helo, Colonel Tigh to Six, Baltar, Apollo and Starbuck at the higher end of the paytable. Click to read the game rules and View Pays to view the paytable. ClickBet to select what to bet. You can choose the coins (1 to 10) and coin size (0.01 to 0.05) to bet with. You can play auto by clicking Autoplay and choosing a number of spins. You can stop it at any time by clicking Stop. Or if you prefer you can play manually one spin at a time. Triggered by three or more scatters, in normal mode you’ll earn 15 free spins and all wins will be tripled, while in fight mode you’ll earn 5 (though you may be awarded more frees during the free spins) and a multiplier x1. Randomly activated during normal mode, up to five reels are transformed into a wild reel. Triggered by one FLT symbol on reel 3, 10s, Js, Qs, Ks and Aces are replaced by a random symbol. Each spin increases your rank in this game and unlocks video content. Battlestar Galactica online slots gameis fabulous with an astonishing array of cool features.